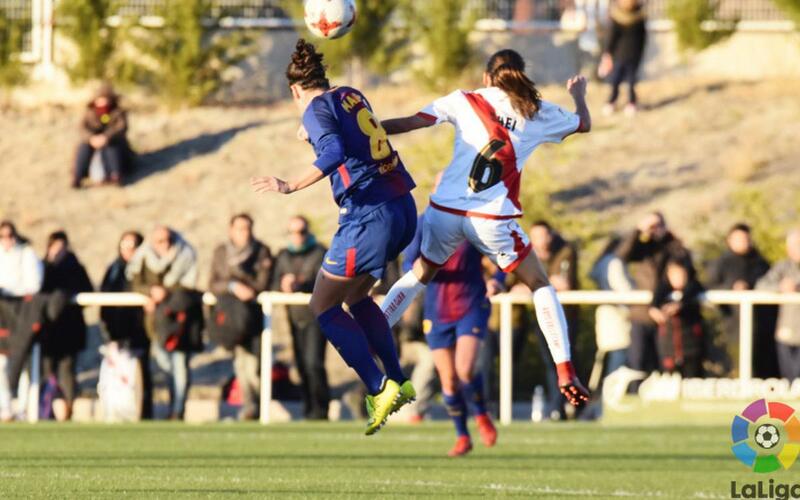 A 70th minute lob from England international Toni Duggan secured Barça the three points at Rayo Vallecano on Sunday afternoon, and means they’ll spend the Christmas break sitting on top of the Liga Iberdrola table – nudging Atlético Madrid into second place on goal difference. What’s more, they have the best records in the competition both for goals scored (52) and goals conceded (a paltry five). It was a confident performance all the way against a strong side that’s currently seventh in the table, with Bárbara standing out in the early minutes, perhaps boosted by receiving the award for the November goal of the month trophy before the game started in honour of her fabulous strike against Betis. Shortly after Duggan had hit the crossbar, Patri had more fortune with a long-range thunderbolt to put the Catalans in command. Rayo upped their game following the goal, but it was still Barça that looked more likely to add to the afternoon’s scoring, and it was very much against the run of the play when the home side managed to pull level from a corner. But Barça didn’t let the goal get to them. They knew they were the better team and that there was plenty of time left to set things straight and that’s precisely what Duggan did with her eighth goal of the season.